Whether you’re repairing your credit in the wake of identity theft and fraud, or you’re trying to prevent it, a credit freeze – also known as a security freeze – could be a good fit for you. With a credit freeze, no creditors will be able to access your reports, or generate credit scores based on those reports. This should prevent identity thieves from opening new accounts in your name. That said, a credit freeze does have its shortcomings. Weigh the pros and cons, then follow these steps if it seems like the right thing to do. If someone tries to open a new credit account in your name, a credit freeze will prevent the credit check necessary to consider the application. However, restrictions on credit reports do not apply to your existing creditors, debt collectors collecting for your existing creditors, or government agencies under certain circumstances (e.g., court or administrative order, subpoena, search warrant), all of which will still be able to access your credit file. You will also continue to receive prescreened credit offers, unless you opt out. Every 12 months, you are entitled to see your credit reports for free through AnnualCreditReport.com. Placing a freeze on your credit does not jeopardize this access. You can either request all three credit reports at once or stagger them throughout the year. Beyond that, you can continue to use any credit monitoring service that you had in place prior to the credit freeze. Your creditors can still report your credit activity to the credit bureaus, and the bureaus can still update your credit reports accordingly. So it continues to be important for you to practice good credit-building habits. Plus, you’ll be protecting your credit score from the potential damage done by thieves opening new credit accounts in your name (and the subsequent credit repair process to straighten things out). While there is no guaranteed way of preventing identity theft, a credit freeze is one of the most effective preventative measures you can take. Most creditors will not extend new credit without access to your credit reports or scores. This makes a credit freeze an invaluable tool in protecting yourself, whether you have already been a victim of identity theft or not. The only thing a credit freeze helps protect you against is the creation of new credit accounts. If someone gets their hands on your credit card information, they could still use it to make fraudulent charges. That’s why it’s so important to keep a close eye on your existing accounts – by reviewing your statements and signing up for credit monitoring services – to catch unauthorized transactions as soon as possible so you can to minimize the damage. The same freeze that prevents other people from opening new accounts in your name will prevent you from doing the same. Every time you need someone to check your credit for a credit card, loan, rental car, new car insurance, new utility account, new cell phone plan, or the like, you’ll have to lift the freeze before your credit can be checked. Temporarily lifting a credit freeze isn’t difficult, but it can be annoying. Under the best of circumstances, you need to request the lift in advance of your credit application to give the credit bureau(s) time to unfreeze your credit. Under the worst of circumstances, if you can’t find the PIN they gave you to lift the freeze, you’ll have to go through the process of requesting a new one. If you haven’t already, sign up for credit monitoring before you request a credit freeze. If you wait, the credit monitoring service won’t be able to access your credit once the freeze is in place. Credit Karma – one of our top picks for free credit monitoring services – says even a temporary lift of the freeze won’t work. If a freeze is in place and you want to sign up for their credit monitoring service, you will have to remove the freeze entirely, register for their credit monitoring, and then request a new freeze again. But once credit monitoring permission is granted (while no freeze is in place), Credit Karma (and presumably other credit monitoring services you might use) will continue to have the permission necessary to monitor your credit without a problem. Use the links above to find credit freeze instructions specific to each credit bureau. Otherwise, expect to pay anywhere from $3 to $15. Just keep in mind, that’s per bureau, meaning it could cost $9 to $45 to freeze all three of your credit reports from TransUnion, Experian, and Equifax. See fee breakdowns, by state, from TransUnion, Equifax, and Experian. Upon receipt of your request, each credit bureau will send you a letter confirming the credit freeze. File it away in a safe place, as it will contain a PIN that you’ll need when you want to unfreeze your credit. Though losing it doesn’t mean you’ll never be able to have the freeze lifted, those who have been through it say it can be a frustrating process, so take the necessary precautions to keep your PIN safe. Note, you may be required to pay a fee for a replacement PIN. You can request that your credit freeze be temporarily lifted, an invaluable tool whether you need to grant access to a specific creditor or several of them over a period of time. That said, temporary lifts are not available in all states or in all circumstances. For instance, Equifax states that, in Arizona, a date range lift is not available to “protected consumers” and a specific party lift is not available to anyone. If you are unable to get a temporary lift in your state, you can always request complete removal of a credit freeze using the same contact information below. 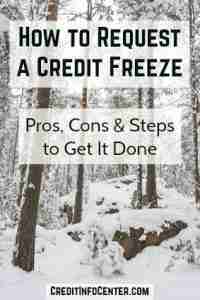 Why lift the credit freeze through all three credit bureaus when the creditor is only going to check one? It’s not only a hassle, but could cost you additional lift fees unnecessarily. If you don’t know which credit bureau a creditor is going to check, ask. Fill out the Lift section of the form that was mailed to you with the confirmation letter you received after requesting the initial credit freeze. Send it to the address provided on the form. Upon receipt of your request, the credit bureau has 3 business days to lift the freeze. So don’t expect to make the request and have the freeze lifted right away, even if you do so online or over the phone. Security expert Brian Krebs says it usually happens within 24 hours, but don’t count it. Just to be safe, make sure the request is made at least 3 business days prior to the lift start date you need. Though both can be helpful tools in protecting yourself against identity theft, there are some major differences between a credit freeze and a fraud alert. While a credit freeze will prevent access to your credit reports, a fraud alert does not. Creditors can still look at your credit, but when they do they will see the fraud alert letting them know they should contact you for verification before extending credit, just in case you weren’t the one to apply. Credit freezes often come at a cost. Fraud alerts are always free. While you must request a credit freeze of each credit bureau separately, fraud alerts are shared automatically. When you request a fraud alert through one bureau, they notify the other two bureaus for you. One caution: If you place a credit freeze, then become incapacitated, it apparently can be difficult for someone with your power of attorney to lift the freeze, even with your PIN. A possible con if you might need a new loan or credit account at that point (e.g., to cover expensive medical care, legal judgments, etc. ).